Just posting a 30min chart (all trading hours) with Blue lines as potential significant PASR zones and White dashed lines are Weekly Pivots. It's a map for coming into Wednesday's trading and beyond. After last week's 5 up-trending days, price has been consolidating near the high of that run in the 1328-1338 range of 10 points. Here's the "picture"
Hope some folks find this useful! I'd like to test myself and give this a shot, if you can correct me. 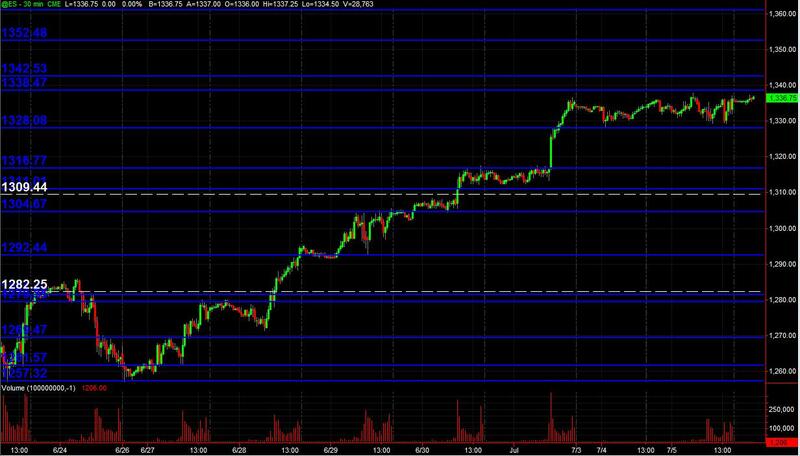 single print at 1pm as mentioned on the 30 min chart and the other at the open air below 33. Don't mean to pry... just like to confirm what I think I know. Thanks! i meant what is/was the level of the single print that formed at 1pm ?